Here in Goa, close to 3 weeks since i let me gypsy heart find familiar ground in new territory. 45 kilometres from North Goa, here in Colva sweating it out for the winter. Once winter is here, there will be no looking back ! All the hard earned money shall be invested in the pursuit of enlightenment. What could be a better way to find yourself, yet again, through the trance~dance phenomena ? 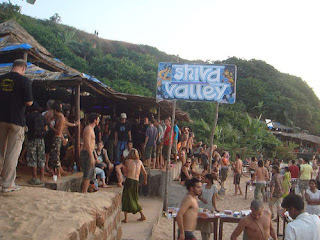 Everyone seems to come to Goa to break free from the routine they are caught in, however there are some who stay back, because they've realized that the city life and the concrete was not how it was intended to be. We as humans have made that choice and we live by our choices till the very day we succumb to the inevitable ( Unless you wanna go the Huxley way ;) ) There is so much in abundance yet it looks like it's all diminishing. It's the view from a city high rise that shouts out loud in claustrophobic disbelief. The heavenly abode of God and other uplifted lives, the Himalayas, they hold an experience for all who dare to go that distance. Within the conscious state and in complete awareness (i could do with some psychedelic interference of the 3rd kind ;), the extremes shall teach what nothing could ever do! Through, persistence, you shall find ! Time to get back ON !